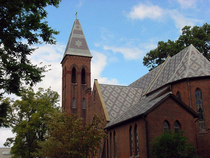 About meFor over 150 years, the mission of Grace Episcopal Church, Paducah, has been one of fellowship and ministry. A place where people of diverse experiences can come together in the presence of God with a spirit of unity and common worship. Our doors and arms are open, not just to those who are seeking a place to celebrate their faith, but also to those who are seeking a place to rest and reflect, learn and grow. About my libraryThe library at Grace Episcopal currently contains about 2000 books (likely making it the largest, catalogued theological library in Western Kentucky). The libray is open to all in the community, not just members. Feel free to visit our library during office hours - Monday through Friday, 9 a.m. - 5 p.m.
*Please note that the first tag listed for each book corresponds to the shelf in our library where the book can be found. Other tags are listed simply to making searching easier.